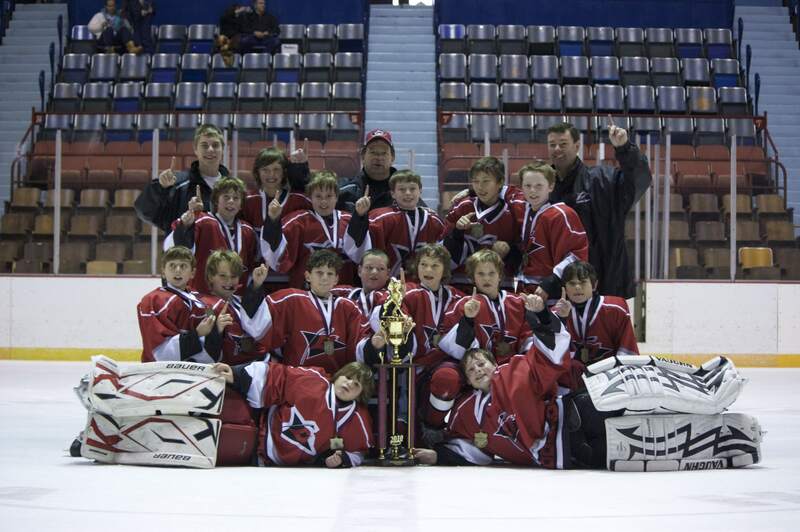 On December 27th, as most of Raleigh stood still covered with 8 ½ inches of snow, the Carolina Storm Red Pee Wee team hit the road, heading north to the Hershey Holiday Tournament, where they created a storm of their own, winning the Pee Wee division. Storm Red faced four challenging games, beginning with the Green Machine Ice Cats. The team went out fast and furious, and by the end of the first period, the line of Mattie Kaminski, Matthew Smigelski and Nicholas Routhier had each netted a goal while also providing the assists on each other’s. This, combined with solid defensive play, led to the final score of 4-2, with Storm Red outshooting the Ice Cats 27-11. Game two reunited Storm Red with hometown rival Hillsborough Sharks. The Sharks opened the scoring only two minutes into the game, but the line of Matthew Doudnikoff, Matthew Cwikla and Ryan Tempke fired back scoring two on the next shift, ending the first with Storm leading 2-1. The pressure continued into a second period full of close checking play and traded goals. Connor Lane responded each time the Sharks seemed to gain any momentum netting two huge goals. Goaltender Devin Barresi was the difference as he dove back for a spectacular stick save late in the final minutes, keeping the Canes up by a goal, with Storm Red winning 4-3. Storm Red faced the Glaciers for game three, who came out fighting. But their chippy play was no match for the Canes. Down a player to injury, centers Cwikla and Evan Thomas rose to the occasion, logging increased minutes. Their two-way play combined with the defense of Michael Bergdolt, Parker Schons, Evan Hoey and Kyle Adams left the Glaciers no chance of scoring. While shots were limited to 13 for the Glaciers, goalie Hunter Young made several excellent saves to secure the shutout, 4-0. Going into the fourth and final game undefeated, Storm Red’s goal was to win and secure a place in the championship. They faced a physical, hungry team in the Hatfield Ice Dogs, and it was a lesson learned about the importance of being mentally prepared to play every game. The Storm was outplayed in every aspect of the game except goaltending. Despite the lopsided score, Barresi made the first save on almost each of the 39 shots yielded. “Devin was all alone out there and should be proud of the way he kept fighting despite the score,” says Coach Dan Routhier. Luckily, the Storm had enough points to make the finals and awaited their opponent. Redemption came the next morning as the Canes were paired once again against the Sharks. The team didn’t hesitate and started the scoring 22 seconds into the game with Smigelski putting one away on a rebound. But when Hillsborough fired back and scored twice within 14 seconds to take the lead half way into the first, Coaches Routhier, Terry Hoey and Alex Kaminski demanded that the team take control of the game. “The boys responded,” says Hoey. The line of Jack Krosner, Thomas and Lane jumped off the bench, with Krosner putting in a big hit that rattled the old Hershey Stadium. Tempke added one for Storm and Smigelski got his second late to end the first period at 3-2, Storm. Excellent goaltending on both sides led to no scoring in the second, with Young making several key saves to maintain the lead. But it became a nail biter of a game when the Storm went down two men late in the third, to give the Sharks a 5 on 3 for a full minute, Then, when the Sharks pulled their goalie to make it a 6 on 3, Storm fans held their breath. In a monumental moment, Routhier blocked a shot, obtained the puck and raced out of the zone. With one man to beat, he went wide, firing a wrist shot into the open net with 1:22 on the clock, clinching the championship for the team. The coaches couldn’t be more proud of the way the team performed. “Honestly, this is one of the hardest working group of players I’ve ever had and they deserved this win,” says Routhier. “They have gotten to know each other over the months and have learned to trust each other on the ice. It’s had a tremendous impact on the way they play, with everyone contributing.” Routhier also credits the dedicated coaching staff and positive influence of this group of parents as keys to this team's success. A demonstrated record of respectfully accepting the rulings of game officials during the season. An exhibited commitment to teamwork by providing all members with recognition of their talents, an opportunity to contribute them to the team, and a spirit of camaraderie. A demonstrated respect for opponents before, during, and after games. 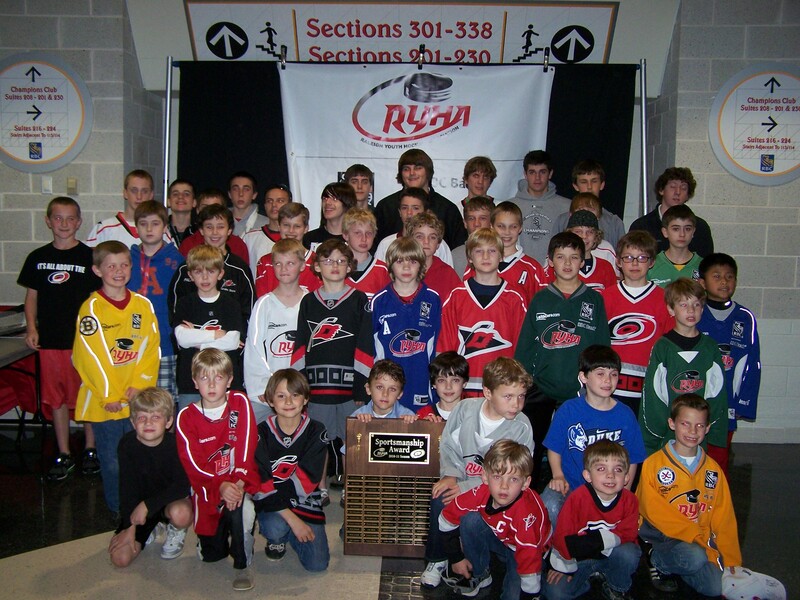 The recipients of the 2010-2011 Raleigh Youth Hockey Sportsmanship Awards are listed below. These student-athletes were honored on Friday, March 18th at the during the second intermission of the Hurricanes game against the Islanders. The plaque will be on display at every remaining home Carolina Hurricanes game at the CYAH table.